Hakone, Japan (see the map below) is a hot spring resort that is quickly accessible from downtown Tokyo. or from the JR Shinagawa Station, or using the Odakyu Line from the Shinjuku Station in downtown Tokyo. 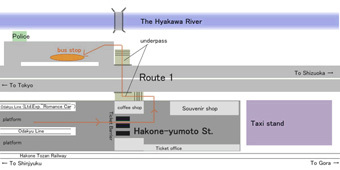 The most convenient nearby station from Senkei is the Hakone Yumoto Station. 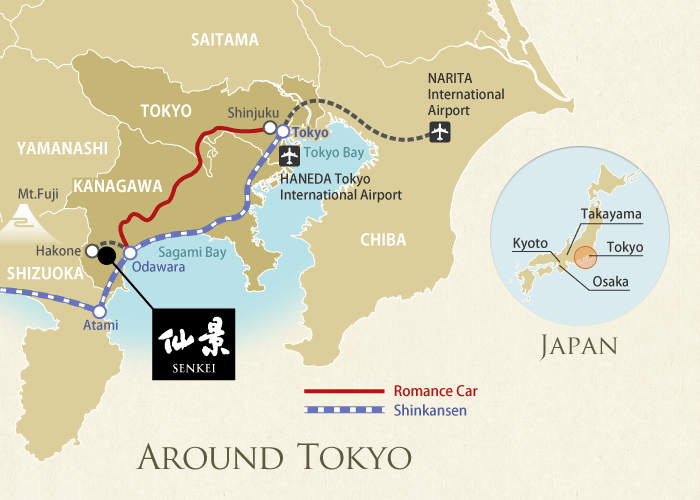 Senkei has three separate accommodations, the Hotel Senkei, the Senkei Annex Yamagaso and the Senkei Plaza Inn. As you look at the location map they are very close to each and within walking distance. From Hakone-yumoto Station to Senkei, it takes 10 minutes by walking. 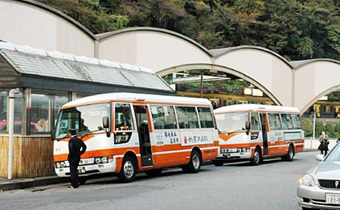 You can also take a regular shuttle bus from Hakone-yumoto Station. This bus stops in front of our Ryokan and other accommodations (a 3 minute ride).